Nash’s fancy boot does nicely as a shoe substitute! saddle. As we walked back from the arena, my mother and I were discussing our riding plan for the weekend … then I looked down. Somewhere, in the darkness of the arena lay the shoe that had been on Nash’s left front hoof when we started. Once again, Fate stepped in to block our riding plans … but this time I was having none of it! 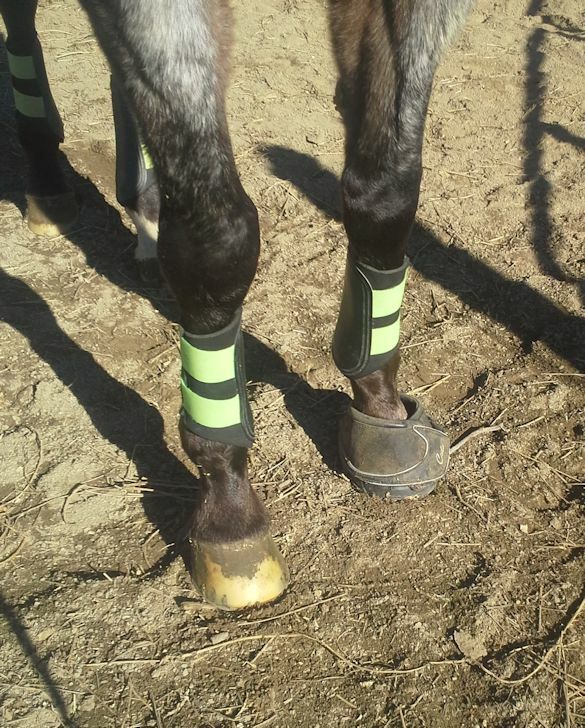 Saturday – a chance for him to ease back into riding, and adjust to the boot. It also gave her a chance to practice her core control and position, with work at the walk. By the end of the session, we got from all “heels and hands” control to the more subtle weight and position aids. Ending on a nice note, I decided it would be to both of their benefits to continue the work the next day. Mom and Nash – a combined age of 97 years! ride in full power steering mode! My girl received a new piece of equipment this week. With the bitless bridle working for the time being, I decided to upgrade it. 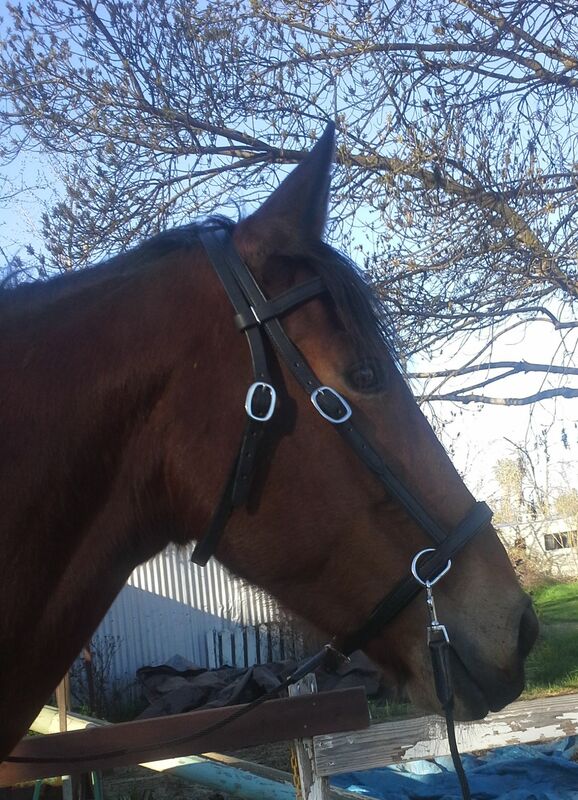 The rope bridle is difficult to adjust, and barely fits her large warmblood head, so a new leather one was in order. It’s taken us all weekend to adjust, but it seems to be working out. However, with all of her trauma now a distant memory, Tally has decided to push the teenage rebellion envelope. Actually, she’s just acting like a mare. My old Dressage trainer used to say that mares learn more quickly – but don’t ever dare to “change the rules” on them! As Tally has settled into work, I’ve started to be slightly more exacting about her attention and the quality of responses. That is not going over so well at the moment, and I feel every inch the mother arguing with her teenage daughter! But this was an inevitable stage for us, particularly with her background … and I’m confident we’ll get past it. Tally modeling her new bridle. My mother has done a very good job of getting her Coffee fit, but I have had little time to work with him. 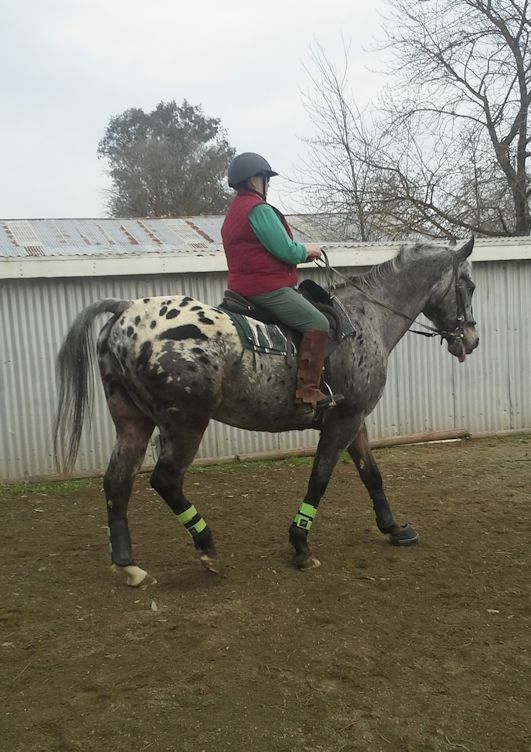 The last time I rode him, this past fall, he was still uncomfortable with the concept of moving out under a rider – and rein contact annoyed him. He was broke to ride when we bought him, but he was trained Western Pleasure – legs mean stop, and the only time the bit touched his mouth was to bang his head into a tuck. Needless to say, none of that is helpful to an English horse! He’s now more fit, and moving better than ever, so I decided to climb up and see what we had. Sitting on Coffee today was like sitting on a baby for the first time. His response to turn aids was hesitant and unbalanced. Leg still means absolutely nothing to him. On one occasion he did venture out into a walk for a bit, then came to an unbalanced halt. A little disappointing, I will admit – but not all that surprising. Yes, he was ridden a bit before, but it was definitely in a “foreign language”. I could certainly push it, and would have if I’d felt anything but confusion from him. But I run a high risk of creating more problems if I rush him now, so we’ll take our time and make sure he becomes fluent in the English “language”. I realize this all sounds very mundane – I wish could report that lots of fancy work was done, or long gallops were had across the countryside. But miracles tend not to happen to me. Still, riders were finally back on horses this weekend, and that is a step forward! This entry was posted in My Journey and tagged bitless bridle, Coffee, fate, finally riding!, lost shoe, Nash, Tally. Bookmark the permalink.